Product prices and availability are accurate as of 2019-04-16 18:10:18 EDT and are subject to change. Any price and availability information displayed on http://www.amazon.com/ at the time of purchase will apply to the purchase of this product. Built to fight and attack enemy ground targets, the F/A-18 Hornet has been in use with the U.S. Navy and the U.S. Marine Corps since 1983. 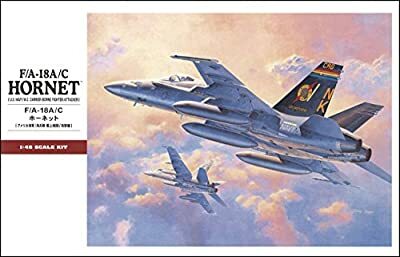 Three years later, the Hornet was chosen by the popular Blue Angels Flight Demonstration Squadron, replacing the A-4 Skyhawk. Top speed is an amazing Mach 1.8 at 40,000 feet (1,915 km/h at 12,190 m). 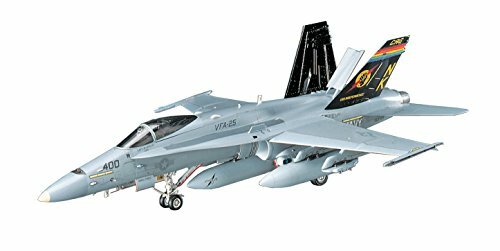 Kit features the option to build an A variant aircraft or a C variant aircraft, as well as two U.S. Navy marking options and one U.S. Marine Corps marking option. Highly detailed model kit includes waterslide decals and illustrated instructions. Decal options included: F/A-18C Fisto of the Fleet VFA-25 CAG US Navy; F/A-18A Valions VFA-15 Capt US Navy; and F/A-18A Checker Boards VMFA-312 US Navy. Paint colors needed: White, Black, Silver, Steel, Flat Black, Clear Red, Clear Blue, Flesh, Khaki Green, Khaki, Burnt Iron, Flat White, Semi-Gloss Black, Tire Black, Clear Green, FS36320 Gray, FS36375 Gray, FS36231 Gray, Radome, FS11136 Red, and FS13538 Yellow.